These participants communicate daily or weekly with their counterparts in the other country. The majority of the responders in the Netherlands were Dutch but a 30% comes from Belgium, Denmark, Hungary, Bulgaria, Ireland, Portugal, Romania, China and Greece. From Greece all were Greeks, except for two Bulgarians. The responders refer to a large range of topics. Most likely, what one impress may really matters to them!. Two bicultural coders worked together to group the comments per category. Apart from the greetings, please and thank you expressions which we allocated in a category named ‘Greetings’, we cluster the other comments per sector, yet what the Dutch or the Greeks ‘see’ may vary in perspective or per entity involved. Some see what they lack in ‘own’ environment others, what they admire in the ‘other’ side, embrace as valuable or viewed as worthy for adoption. The largest percentage we discerned on behalf of the Greeks comprise 29,7% of their total observations and it is related to the ‘working environment’. Dutch on the other hand, mention less or nothing related to a working environment in Greece. Most of them (29,7%) notice a friendly Greek behavioral style. We assigned these observations under the category ‘Agreeability’. The following two radar charts show the semantic categorization we concluded and are presented per national group. In the tables below, we add some of the characteristic comments provided. Work Environment 29,73 – Their working environment, salaries, surveys, team spirit, working hours…could I write everything? – Flexibility in the working schedule, work from home! Time / Planning 19,37 – They keep time-frames in meetings! – They have an excellent sense of what tasks can be accomplished within the day. Procedural / Organizational 18,47 – … they never overwork without a real need and they do communicate their limits to their higher in command without fear they will be regarded as week. – … clearness in job roles. – They all follow a similar procedure when they encounter issues which makes problems solving easier. Communication 6,76 – They are kind with each other. – … They communicate much better among them. They work better as a team. They are not afraid of undertaking responsibilities. – … each one is experts in his/her field. this is something I would like to adopt! Soft Skills 6,08 – They have more patience than us in “difficult” situations. According to the employees in the Netherlands (Dutch was the major group). – They are acting within the contract. – Colleagues of both companies are working on a good long-term relationship! Hard skills 6,90 They are engineers with good technical knowledge. Employees both sides often observe different sides on each category. 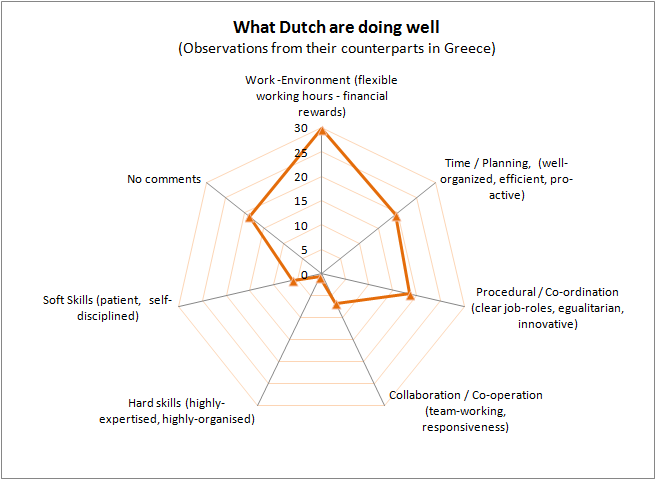 For example, in the ‘Time / Planning’ related category Greeks notice how effectively Dutch go on with time and coordination of activities within the company whereas employees in the Netherlands ‘see’ the individual Greek in Greece: ‘Greeks respond fast, especially in cases of urgency’. 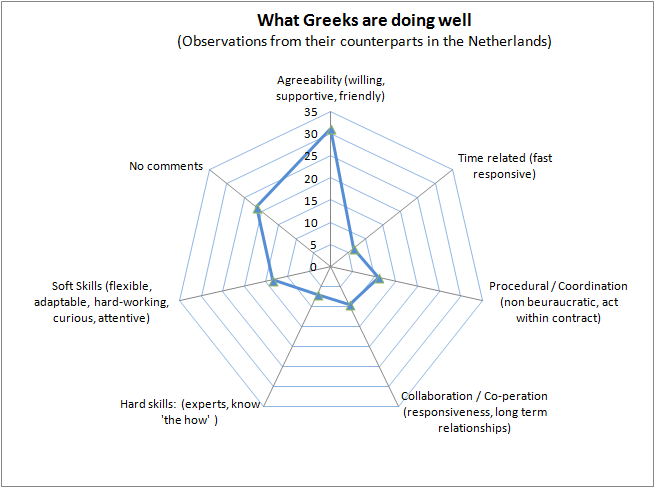 Dutch furthermore, figure out how pride-minded and sensitivity to being respected by them (the Dutch) Greeks are apart from being co-operative (when …respected also notice!). Most of the remarks refer thus, to the Greek as individual. Greeks on the other hand, admire a clear distinction of roles in companies, fearless attitude to hierarchy, self-discipline, task focused attention, effective time-management. Hence, comment on the Organization and the individual level as well. When I notice what the ‘other’ is doing wel, may well indicate a shortcoming in ‘me’ or ‘my’ organization. Which, turns out to be very inspiring and motivating towards changes! I am honored and proud to discuss such dynamic exchange of views and also how such valuable experiences can be utilized and transformed to Intercultural Competence!